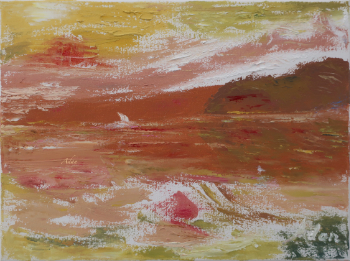 Probably my biggest challenge – besides knowing when the work is done and stop, and thus allowing myself to return to abstract painting after many decades – is what and how to insert something recognizable into the image: a person, or thing – animate or inanimate (sailboats, birds, a bicycle, the moon, etc). One of the reasons it was so hard for me to learn to accept a good stopping point when working an abstract – colors, lines and forms – was I felt I had to evolve the abstract itself into something recognizable. Yet, I was often, actually almost always, much happier with my satisfying abstract vs whatever it was I tried to evolve it into looking like (buildings, clouds, mountains, etc). The answer, for me, even if challenging, in an almost Roschart-like puzzle-like manner, was deciding on the right object in the right location within the finished abstract. Because this allows me, after a series of deliberations re composition & source image & color keys, a period of nearly fully-free expressiveness! It’s hard to express how satisfying this stage of painting is for me – bounded only by a growing awareness to sense when to stop, when to let a streak or stroke of color “be”, and eventually, when to let the work set for the final stages. That final stage, for me, is often a grueling combination of choosing the right object (person or thing) to place into the new world my semi-abstract seems to suggest, then actually executing the tighter yet still-painterly representation into that abstract. Nice painting, I see a desert landscape looking through a haze.